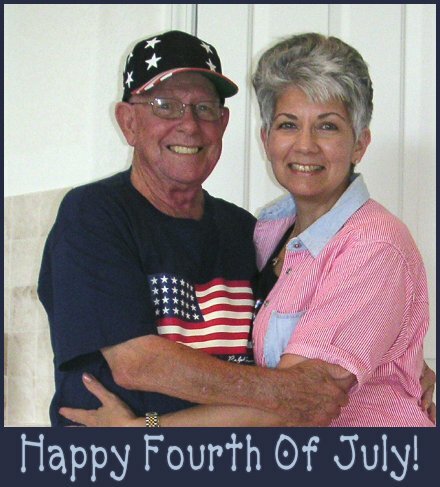 Happy Fourth Of July From Bill and Rosie! Just dropping in to wave the Flag on the Fourth of July! We have so much to be thankful for and this song by Lee Greenwood says it all. I especially thank my husband Bill for serving in WWII, Korea and the beginning of Viet Nam. He and his buddies did a lot to make America the Land of the Free and The Home of the Brave. Now, my nephew Bradley Leone is serving in Iraq. Special thoughts and prayers for his safe return home would be greatly appreciated! Click here to hear Lee Greenwood sing this song. I am delighted to have so many visitors! Please visit often for updates!